HOUSTON, TEXAS, UNITED STATES, October 1, 2018 /EINPresswire.com/ — Earlier this year STOlogix launched a new front-end software solution which streamlines the functionality of complex and disparate software applications required for STO event planning1. 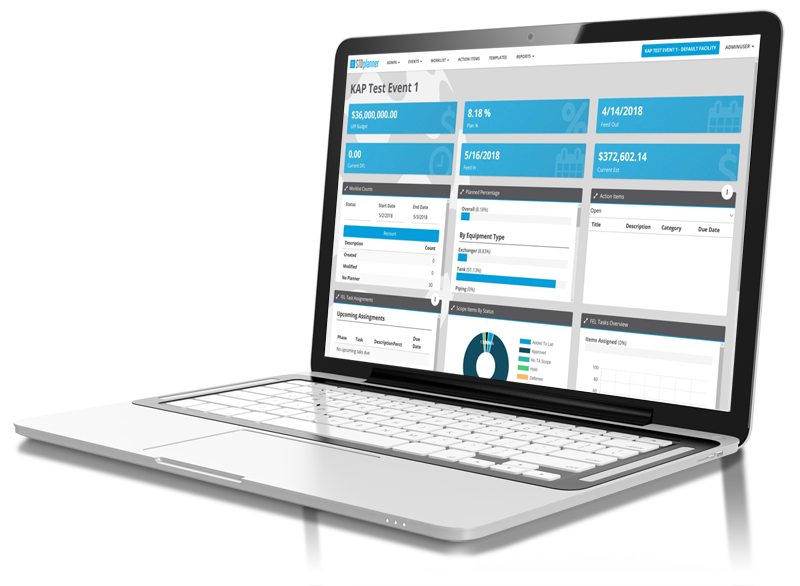 The new software solution, STOplanner, was developed by KAP Project Services, a leading project controls and project services provider for the petrochemical industries. Previously the only solutions available for STO planners have been complex and expensive applications which are used for many of the required functions for identifying the proper event scope worklist and planning work performed in corrective, preventative, and predictive activities. Some of these solutions include tools such as SAP, Primavera, Maximo and other CMMS solutions none of which address whole event readiness planning through all phases of the project lifecycle. Each of these applications are often not integrated and require expensive licenses, extensive training, and difficult analysis to ensure readiness for STO event schedule development and work execution – presenting a significant barrier for organizations seeking to improve scope and planning operations which are often shared between in-house and contract personnel. STOplanner eliminates these pain points as it is designed to bring the ability to budget, plan work activities, plan required materials and personnel requirements into a single, intuitive platform which offers streamlined efficiency and visibility across the STO stakeholders. There is a very low threshold of training to use STOplanner, and with role-based permissions, data cannot be corrupted but easily communicated to everyone with a stake in the event. The ability to make this information readily available to the whole team drives more participation from all departments, participants and stakeholders. Organizations that have used previous versions of the solution benefited from more efficient planning and estimating, along with quicker transfer of job plans into the schedule saving time and money. Perhaps more importantly, better data is generated and organized to help the team make better decisions regarding the turnaround event earlier in the timeline than with traditional methods. The ability to have all this organized information that is easily shared across the entire turnaround organization leads to better results, shorter learning curves, better data, and ultimately, better outcomes for the whole event including a quicker ROI. STOlogix offers a Shutdown, Turnaround, Outage (STO) planning software solution (STOplanner) to its current and prospective customers designed to drive an improved customer bottom line through successful event planning. STOplanner is the first tool of a software suite. It extends the KAP Project Solutions value through the addition of a solution platform of people, process, and technology for best practice work execution for shutdowns, turnarounds, and outages to include capital project planning. For more information visit www.stologix.com or email Blake Powell at bpowell@stologix.com.